Famovape Fat Baby Mesh Sub Ohm Tank Review - Daily Vaping Deals & The Best Vape Product Reviews at Vaping Cheap! In this vape review, we’ll be taking a look at a brand new vape tank to hit the market, the Famovape Fat Baby Mesh Sub Ohm Tank. Famovape is a relatively new company in the vape industry, and this is their second atomizer to be released. Just like some of the newest tanks to be released, the Fat Baby Mesh Tank does include Mesh coils, which has certainly become something preferred by many vapers who enjoy these type of atomizers. Although building with mesh wire hasn’t been the most popular, the mesh replacement or pre-built coil heads have proven itself to be one of the best type of coils you can buy. Before getting any further into this review, we’d like to thank Famovape for sending this product our way for the purposes of this review. We’ll cover our first impressions, usage, performance, pros and cons, and conclude with whether or not we recommend the Famovape Fat Baby Mesh Sub Ohm Tank! Click Here to Check Out the Famovape Fat Baby Mesh Tank! The Famovape Fat Baby Mesh Tank does come in a pretty nice box, which easily slides open. 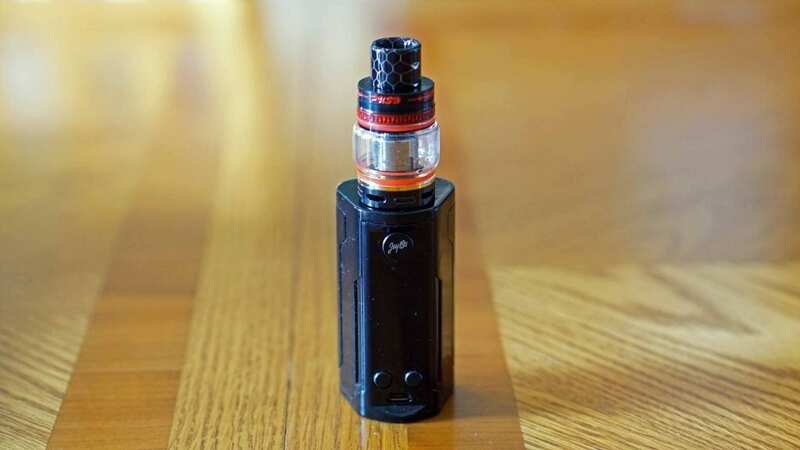 The front of it states the name of the atomizer while the back provides some information about the tank and some of its features. 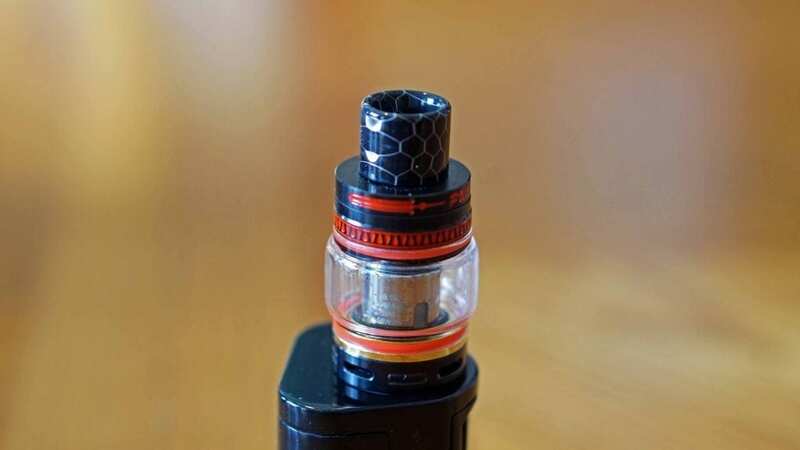 On the side of the packaging, you’ll see what’s included which is the Fat Baby Mesh Tank, a replacement glass tank, an extra mesh coil head, user manual and spare o-rings, screw and gasket for the top fill section. Everything is presented well, which is always a good thing in my book. Once you slide open the packaging, you’ll see everything that’s included. I do want to mention that the bubble glass tank is pre-installed, which for me is preferred. With the bubble glass tank is does hold 6ml of e-juice, which is quite a lot as most sub ohm tanks are between 3ml and 5ml. With the standard glass tank, it does hold 4.7ml, which is still pretty good in my opinion. Something else worth noting is that the two coils you do receive are the same 0.15 ohm M15 coil head, which do feature mesh wire. To me, this is definitely a good thing as a lot of vapers enjoy these mesh coil heads including myself, so why not include two! These coils are rated between 40w and 100w, but is best vape between 50w and 80w. This is stated on each coil head. The Fat Baby Mesh Tank does share similarities to some other tanks on the market, but differentiates itself with the designs which you can see across the top of the atomizer. 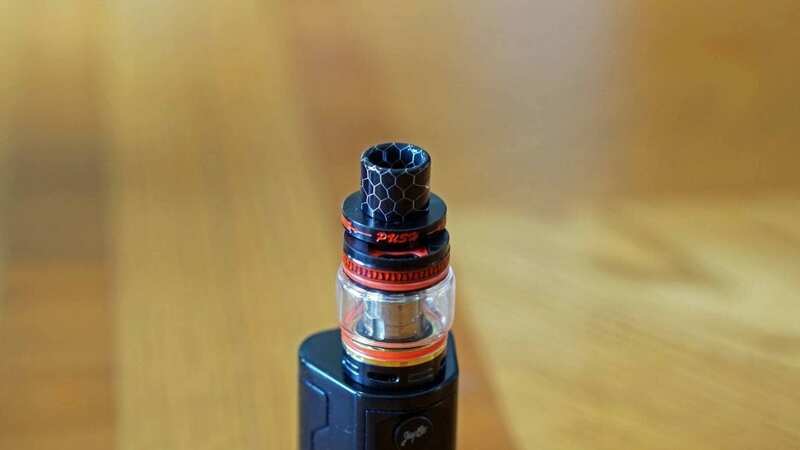 In addition, the airflow is a bit different as well, there are four airflow holes and whatever you adjust on one, it will adjust for the other airflow slots. My color specifically is the Black/Red, but there are other colors available such as Stainless Steel, Rainbow and Gold. I really do like the black and red theme with mine, it does give it some “spice” and doesn’t look too plain or boring. However, this is subjective. The included drip tip does feature a 9mm bore and is constructed of Resin, but it is quite tall. I do wish it was just a bit shorter as I do prefer more low profile drip tips, but that’s also personal preference. Thankfully it’s an 810 size, so you can use different 810 drip tips if you preferred. Lastly, this vape tank did come clean with no machine oil whatsoever, which is always a pro for us! All in all, my first impressions of the Famovape Fat Baby Mesh Tank were great! I really did like the packaging, and the color theme of my specific tank. Not to mention, the fact that this tank included two mesh coils rather than one was definitely a huge pro! Since this is a sub ohm tank, there’s no too much to go over when it comes to using it. The Fat Baby Mesh Sub Ohm Tank by Famovape does sport an overall base diameter of 25mm. Since it’s on the larger side, it looks great on all of my larger box mods such as dual or triple 18650 devices. There are some smaller mods of course that it’ll look great on, but I much preferred to use this atomizer with a dual battery mod since I was vaping it at slightly higher wattages. Adjusting the airflow is quite easy, but I must say that when I first received this tank the airflow control ring was pretty tight and it was difficult to adjust the airflow. However, after some time using it, it did loosen up a bit and became much easier to adjust. I rather it be this way though than being too loose. With that being said, once you adjust the airflow, it won’t be moving at all no matter if it’s in your bag or pocket. Like mentioned previously, when adjusting the airflow, whatever you adjust for one airflow slot, the others will also adjust as well. Filling the Fat Baby Mesh Tank is pretty easy as well. It does feature a “push to open” design, where you simply push a specific side of the top and it slides open. I do want to mention that it is clearly marked where you need to do this since the specific side does say “push”. This is something that a lot of companies either don’t do at all or they put a very small indicator, which is hard to see, so I was glad Famovape went this route and made is quite clear where you actually push to open the top fill. The fill port does slide open easily, and the fill port is a decent size to support bottles like the Chubby Gorilla Unicorn Bottles and dropper bottles. I do wish it was slightly bigger though since there isn’t another fill port to let air escape, which can always lead to issues. It’s not the biggest deal in the world, but it’s still something worth mentioning. This tank does come pre-installed with a coil head, as does most sub ohm tanks do. Replacing the coil is straightforward and pretty much the same as most other vape tanks on the market today. Simply unscrew the base then unscrew the coil that is installed. Once this is done, you can install the new replacement coil head. 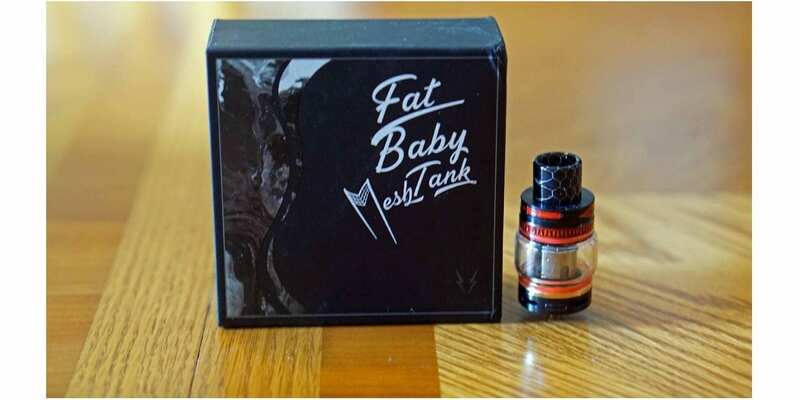 Overall, using the Famovape Fat Baby Mesh Tank is easy and is just like most other tanks on the market. It’s easy enough to use for both the beginner and advanced user in my opinion. Now the biggest question of this review is how does this tank actually perform? Well, I can certainly say it performing exceptionally well! Firstly, the included mesh coils were excellent performers, and for pretty much any tank, it all boils down to the coils when it comes to how well the flavor and vapor will be. If a tank has coils that are terrible performers, then your vape experience won’t be great. Thankfully, both of these coils are great! The preferred wattage for me with the M15 0.15 ohm coil heads were between 60w and 70w. I found that this wattage is where it performed best in regards to flavor and the warmth of the vapor. It did handle up to 100w, but honestly you don’t really need to push these coils that high to get exceptional performance. For a sub ohm tank, the flavor was top notch in my opinion and it does perform with the best of them when it comes to mesh coils. The first coil I vaped on lasted almost two weeks before I noticed a decrease in performance. However, I purposely used an e-liquid that had a decent amount of sweetener to see how long it could last and honestly I was quite surprised it lasted as long as it did as some coils barely last a couple of days with e-juice that has a lot of sweetener in it. So, I’d say with e-liquid that has minimal amount of sweetener or none at all, you could probably get up to 3 weeks without needing to change the coil, which is definitely a good thing. The second coil in the packaging performed just as well, and I’m still vaping on it without any decrease in performance. I will say though that with any sub ohm tank, you’ll plow through e-liquid rather quickly and this can be said for the Fat Baby Mesh Tank. I could easily go through the 6ml capacity within an hour if I were chain vaping. Also, it is worth mentioning that the break in period with these coils are very minimal, after about a quarter of a tank I was getting full on flavor! Onto to the airflow, this tank is very loud. For some reason, I’ve noticed that a lot of tanks that feature mesh coils have pretty loud airflow. It does get just a little bit quieter if you close off the airflow a bit, but it’s still rather loud. I actually preferred to close of the airflow a bit since the airflow wide open was a bit too airy for me. However, if you like a lot of airflow then you’d probably be satisfied with it since there’s just a little bit of restriction when it’s wide open. All in all, the performance of the Famovape Fat Baby Mesh Tank was excellent! The only downside for me was the loud airflow, but the flavor I was getting was top notch, especially when considering this is a sub ohm tank. In conclusion, the Famovape Fat Baby Mesh Sub Ohm Tank is a solid performing vape tank that offers great flavor, and is easy to use. I love the fact that this tank does include two mesh coils rather than one, because the performance from these mesh coils have been much better thus far in comparison to traditional coil heads. The flavor and longevity of these coils are so much better, so you won’t be needing to constantly replace coils; therefore saving you money down the road. There were a few cons to mention though with this tank and the biggest one for me was the loud airflow. Like mentioned previously, I’ve found that a lot of tanks that include mesh coils are typically louder than others. However, it’s still something worth mentioning as some vapers simply dislike when a tank is loud. The other two aren’t that big of a deal in my opinion and one is subjective. You can always use your own preferred 810 drip tip. All in all, if you’re looking for a solid performing sub ohm tank that has a large e-liquid capacity and includes multiple mesh coil heads, then I can surely recommend the Famovape Fat Baby Mesh Tank! We hope you find this review helpful in finding the right sub ohm tank to fit all of your vaping needs! Feel free to leave any questions or comments down below! Thanks for reading! I imagine the snake in tank, but very nice review Steve! thank you!